Ahead of the North Cachar Hills Autonomous Council (NCHAC) elections, suspected militant outfits’ activities have increased again in once insurgency-dominated hill district, Dima Hasao. The resurface of militant activities first came to light with the incident of kidnapping of a 70-year-old man in Maibang sub-division under Dima Hasao district recently. 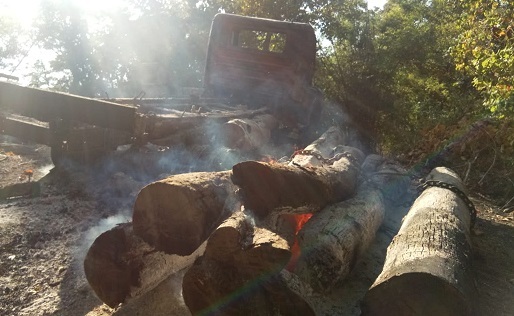 The latest incident, where militants’ involvement has been suspected, is the torching of four illegal timber-laden trucks which were found in a forest along the Dima Hasao-Karbi Anglong border area. According to information, suspected militants entering Disabra village under Langting Police Station along the Dima Hasao-Karbi Anglong border torched the four trucks which went to the forest in the area to carry illegal logs. However, there has been no report of any casualty. The Langting police have already swung into action. However, police have failed to arrest none in this connection so far. The incident has taken place 50 km away from Langting. The incident has created sensation in the hill district of Dima Hasao. It may be mentioned that there were total six trucks. 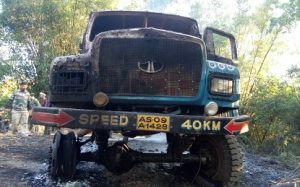 The Officer-in-Charge of Langting Police Station, Gunajit Pathak, also admitted about the torching of the four timber-laden trucks. However, he said that it is yet to be known who is involved in the incident.